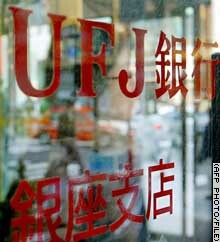 UFJ and other big Japanese banks reported strong interim results. TOKYO (Reuters) -- Japan's big four banks are on track to post their first annual profits in three years after Mizuho Financial Group, which ran up the nation's biggest ever corporate loss last year, led the way in reporting half year profits. The banks were helped by higher stock prices. A tax windfall and progress in whittling away bad loans also contributed to a turnaround for Mizuho, the world's biggest bank by assets, as it joined UFJ Holdings, Sumitomo Mitsui Financial Group and Mitsubishi Tokyo Financial Group in reporting stronger interim results Tuesday. UFJ Holdings posted a net profit of 180 billion yen for the half-year that ended September 30, while Mitsubishi Tokyo Financial Group's result was 300 billion yen -- the highest among the big banking groups. Mizuho Financial Group reported a net profit of 255 billion yen -- more than double its initial forecast -- while Sumitomo Mitsui Financial Group posted a net profit of 140 billion yen. Excluding Resona Bank, which was bailed out by the government in June, the top six banks reported a combined net profit of 944 billion yen ($8.64 billion) for April-September, compared with 38 billion yen in combined half-year profits a year ago. The stock market's benchmark Nikkei 225 average rose 28 percent in the six months compared with a 15 percent drop in the same period last year, and unrealized gains on share holdings more than offset unrealized losses from a weaker Japanese bond market. The settlement of a tax dispute with Tokyo city government resulted in a combined 193 billion yen payout in refunds to the top seven banks, all of which reported results on Tuesday. Mizuho said it expects a profit of 360 billion for the full year. In the year to March 2003, the banking group reported a record loss of 2.38 trillion yen ($21.77 billion). Excluding Resona, the results showed the six top banks had made progress in cutting bad loans and volatile share holdings of about 16 trillion yen -- two factors that pushed them into the red last year. They also made headway in addressing the quality of their capital. "There are still some uncertain points about exactly how bad loans are classified, but it appears they are getting stricter in their assessments and that the disposal of sour debt is progressing," said Makoto Suzuki, a fund manager at Chuo Mitsui Asset Management.